It has been over six years since I last spoke about the Vigour system in any detail, but my latest updates to the campaign have been dealing with polishing this system using the scripting knowledge I now have compared to back then. 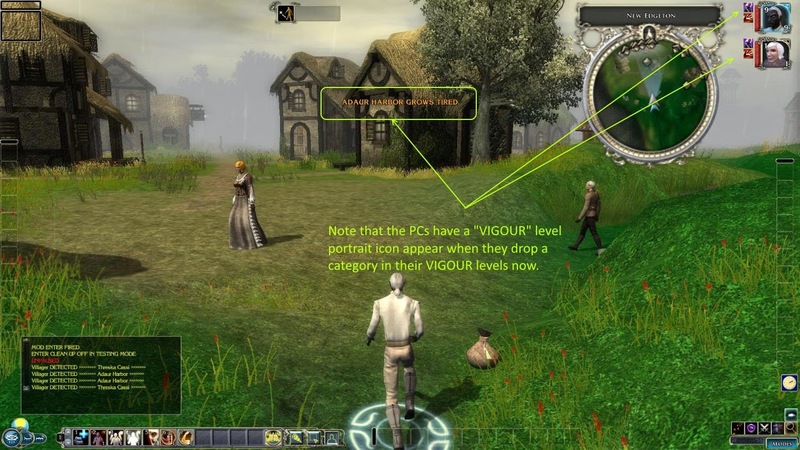 One update, the effects of vigour are now added to PCs as icons next to the portrait. That is one update that can be "seen", but a lot more has been updated "under the hood". Some news will be similar to before, but there are definitely a few changes for the better I believe. These changes had to be made to make the system fit better with long distance travel and make more sense in general. As you see from the chart above, the main difference between the old version and this new version is that the 100% is divided equally between REST requirement penalties (> 50%) and FOOD requirement penalties (0 - 50%). The key thing to remember is that eating FOOD will improve any vigour up to 50% and the PC would need to REST to improve the vigour to 100% to remove all penalties. 1) A PC cannot REST without access to food, but they can WAIT. 2) A PC cannot REST until 8 hours has passed from their last rest (unless at an inn). However, note that the above vigour penalties do NOT begin until it is time to REST after 8 game hours has passed anyway. Therefore, vigour penalties will only ever apply if the PC cannot rest (due to their environment) and/or does not have access to food. Note, also that allowing time to pass using the WAIT option during a rest, will also impact on a PC's vigour depending upon the number of game hours waited, according to the table above. Therefore, it becomes important for PCs to have access to food if they WAIT for any periods of time. Hunger now attributes to the worst penalties if not maintained. As a guide, an iron ration improves vigour by 25% up to a maximum of 50% vigour score. Other sources of food improve the vigour score by more or less than 25% upon consumption, but always only to a maximum of 50%. Therefore, the game mechanics stop a PC from eating an iron ration (if the player tries) if their PC's vigour score is already 50% or higher. On the other hand, some other food items may be used and wasted if used inappropriately. If the PCs find the Arcaene Magik scroll, Create Food and Water, (and can use it) then suffering from hunger would not be a problem for them again. If a PC becomes DEPLETED and they carry an iron ration within the player's group, then they will automatically eat it. This check to eat food is made earlier if the PC uses the WAIT command: The system checks if the PC has become FAMISHED during the WAIT time and makes the PC eat a ration if available to stop them from dropping below 20%. The player can obviously continue to use food items to bring their PCs up to 50% if available and need be. In the former (overland map travel), vigour drops rapidly as the player moves their party across the map, and the system automatically feeds the party with available rations when the leader drops to 65%, boosting them back to 90% unless the rations had to be shared, in which case they get only a proportion of the normal 25% boost. If the food runs out, then the vigour continues to drop to 0%, whereupon it continues to accumulate additional HUNGER damage in the way of penalties to attack and damage every hour, up to a maximum penalty of -5. Any penalties due to lack of vigour are applied to the party members when they leave the overland map and return to a "normal" area. In the latter (clicking on a map to travel to a destination), the result will tell you if the party has enough provisions to reach the selected destination. Or, if the party could make the destination by sharing the provisions they have. If the party have sufficient provisions, then they make the journey without any impact to their vigour and simply pay the amount of provisions required. If the party have to share provisions, then they will arrive at their destination with vigour penalties for sharing. The maximum amount of sharing can leave the PCs with no less than 10-20% vigour (and associated penalties), subject to how much they had before starting their journey. 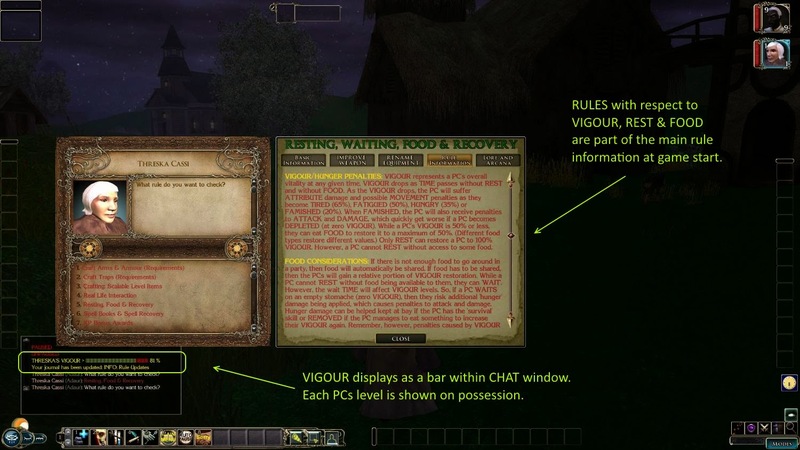 The vigour (rest and hunger) rules available in game!